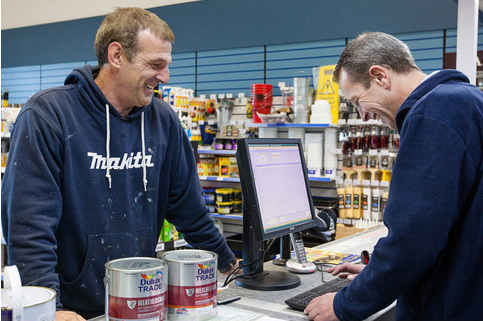 Brewers decorator centres stock an unrivalled range of the trade paints and supplies you use every day, along with all the designer colours and wallpapers your clients ask you for. With a network of 172 stores, we can usually supply from stock. If you need something particularly exotic we can call on a huge supplier network – just ask. Our interior specialist stores give you and your customers a chance to choose designer wallpapers and paints from a huge range of brands, with help on hand from a Brewers interiors specialist. We offer fabrics, hand-made-to-measure curtains and blinds too. Your customer can pay directly or you can order on account. Whatever you need, we offer intelligent advice from experienced people. Speak to us in your local store or arrange with your Brewers representative to meet you on site. If we don’t know immediately, our extensive trade connections will help us quickly find the answers you need. If you’re in an established, large decorating business you can apply for a Brewers credit account, giving you a dedicated account manager, negotiated prices on the items you buy most with free delivery and up to 30 days to pay. Smaller businesses can apply for a Brewers cash card for the convenience of buying online with free delivery, a Brewers representative and discounts from your local store. Cash card holders also enjoy free coffee in our larger stores. All our stores can accurately mix BS4800, RAL and NCS colours if you’re working to an architect or designer’s specification, along with all the Dulux, Crown and all the designer paint brand colour cards. And if you need to match a colour and you don’t know what it is, we can scan a sample (4cm square or bigger works best), and mix the closest match from a range of X,000 colours. Brewers colour matching uses one of the most accurate systems available. For heritage restoration projects we can advise on recreating original colours formulated with the widest range of modern paint finishes, and advise on period-correct wallpapers. Our specialist spray stores can supply and advise on a comprehensive range of spray equipment from starter kits to advanced airless systems. If your customer prefers to buy their own materials wallpaperdirect.com is our dedicated wallpaper website, designed to help your customers choose the perfect wallpaper for any room from a choice of around 14,000 designs. Refer a customer here and they’ll get £10 off their first order, all thanks to you! designerpaint.com lets them select just the right shade from around 3,000 designer brand colours. brewershome.co.uk offers soft furnishings and furniture along with an edited offer of wallpaper and paint. Type any other questions here. We’ll come back to you within one working day.